Public-safety responders put their lives on the line every day to protect citizens from threats of all kinds. For most of us, this dedication and effort is taken for granted, as it goes largely unseen. This is because police and fire departments—and other first-responder agencies—are committed to being responsive in emergency situations while ensuring that citizens continue to enjoy the freedoms of living in an open and accessible environment. This openness is put under the most stress during large public events. These require detailed planning and the optimal deployment of resources and personnel to ensure that, in an emergency, help gets to the people that most need it as quickly as possible. Fortunately, increasingly sophisticated technologies have been introduced to assist public-safety organizations in their efforts. One of these is three-dimensional (3D) location, which can locate a wireless device on both the horizontal and vertical planes. 3D location provides first responders with increased situational awareness, by continuously monitoring an environment and pinpointing the originating location of emergency calls, and with better operational efficiency, by dispatching the nearest team with the proper equipment to reach those in need of help. Enhanced location accuracy and quicker responses have been proven to save lives. The following notional use case of a city’s management of a downtown parade illustrates how situational awareness based on accurate 3D location can improve operational efficiency, reduce costs, and help save lives. A major city’s coordinated public-safety efforts—involving police, fire, and EMS—had been challenged every year during the city’s Independence Day parade and street fair. The event attracted tens of thousands of attendees to the two-mile-long parade route and nearby block parties. Public-safety agencies were challenged by the large numbers of people, limited street access for emergency vehicles, and the use of high-rise buildings as viewing points along the route. In order to maintain safety and ensure that they were able to respond quickly to emergencies wherever they occurred, agencies ended up overstaffing the event, staging field teams throughout the area. Despite dedicating these resources, response times to incidents lagged. Two key reasons: agencies did not have a real-time view of exactly where their teams were located, and emergency calls from high-rise buildings did not identify the floor number, unless it was provided by the caller. “During the annual Fourth of July parade, my team is under increased pressure to make sure people stay safe,” according to the city’s public-safety director. “We do a good job in crowd control and in identifying threats before they become a problem, but we can only do this by flooding the streets with officers, which isn’t very efficient and—event then—doesn’t solve the problem of how to get the right officers to the people who need them most. “Our response times lagged year over year, and we particularly had an issue in getting to people who hold viewing parties in the high-rise condo and office buildings along the parade route. When a 911 call comes in from one of those locations, we don’t always know what floor to go to, and callers can’t always identify their exact location, since many of them are visiting and are unfamiliar with the area or—more importantly—may be incapacitated due to a medical emergency and unable to provide locations specifics, such as apartment or suite number in a multi-story building. The public-safety agencies were able to solve their problem by deploying a real-time situational-awareness and communication solution with high accuracy 3D location via a downloadable application into the department’s mobile devices. The technology pinpoints location on three dimensions by utilizing all available signals and sensor measurements, such as cellular, Wi-Fi, GPS, barometric sensor data, and motion sensors from nearby buildings and the device itself. With this capability in place, emergency field teams are now able to be located with high accuracy throughout the area, even in high-rise buildings. At the first-response command center, police, fire, and EMT resources are all visible on a map and are connected to each other via a push-to-talk, instant-communications capability. 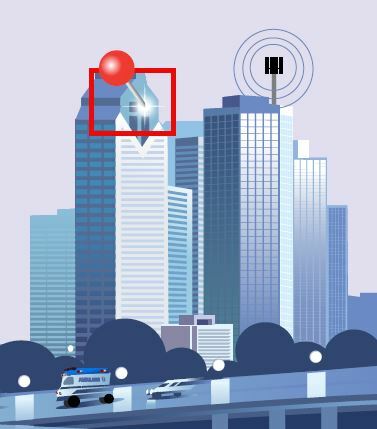 Assuming the wireless operator has deployed vertical-location capability into its network, when an emergency call comes in to the public-safety answering point (PSAP), the caller’s exact location—including floor level—is easily determined. The first responders in closest proximity are dispatched, shaving seconds and, sometimes, even minutes off the response times, which can mean the difference between life and death, in some cases. 3D location provides increased situational awareness, so agencies can identify issues and quickly move resources into place. With 3D location, the agencies can rightsize their staffing requirements on parade day, resulting in reduced costs and better operational efficiency. This has enabled them to redirect these budget savings toward newer equipment and proactive help stations for non-emergency situations, such as minor injuries, lost children and traffic incidents. The enhanced capabilities and better visibility won plaudits from the city. “We are very happy with how 3D location has made our job of being responsive to, and protecting and serving the public much easier,” the director stated. “Instead of placing field teams everywhere and anywhere, I can more strategically assign personnel where my data has shown they are most likely to be needed and have the confidence that I can quickly reposition them in real time, if the need arises, because I know the exact 3D location of both the caller and first responders. This city’s experience is not unique. As more public-safety organizations take advantage of new technology to locate their own personnel and people who rely on them for help, response times are going down. and the number of successful outcomes and lives being saved is going up—all thanks to real-time, high-accuracy 3D location. Amir Sattar is vice president of Polaris Wireless, a provider of software-based wireless location solutions.